Av. Velazquez 212, 29004 Malaga, Spanien. 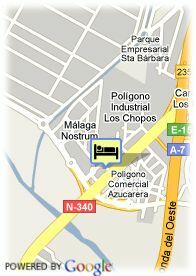 A hotel where quality, comfort and service are included. Whether you are here for business or visiting family and friends, the Campanile Hotel offers you maximum comfort, friendliness and practical modern facilities. 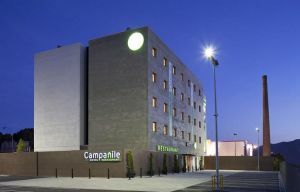 With 114 comfortable and well-equipped rooms, Campanile has everything to help you relax, move freely and work efficiently if you here on business. For your refreshment, a courtesy tray is available daily in your room. 4 rooms, adapted with accessible facilities. For your comfort, each room has quality bedding, a bathroom with either bath or walk in shower, air conditioning, a television with Free-view channels, a work space, telephone with a direct line and Wi-Fi connection. From 6:30 am, have a nutritious and tasty start to your day with our selection of fruits, cereals, pastries and traditional English breakfast. We offer you a selection of seasonal ingredients that guarantee quality and freshness all year-round. Discover our many choices of meat and fish and our daily specials. Kostenlose open air Parkplätze beim Hotel. Wenn man die Reservierung nicht benutzt und keine Annulierung macht: 1 Nacht soll gezahlt worden. Kinder weniger als 2 Jahr(e) alt: gratis. Visa, Mastercard, American Express, Carte Bleue.